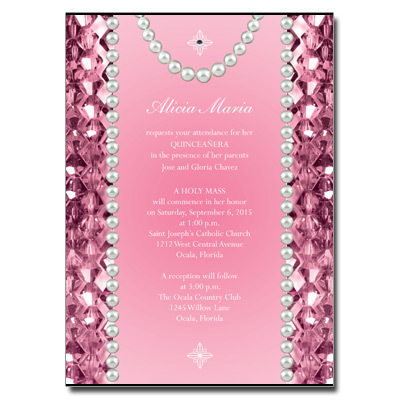 Images of pearls and pink crystals decorate the side of this Quinceanera invitation, perfect for your princess' big day. One real, stick-on jewel is added at the top for real-life sparkle. Your daughter's name is printed in script at the top with personalized event information below. Card measures 5x7 and comes with stick-on jewels; light assembly required.